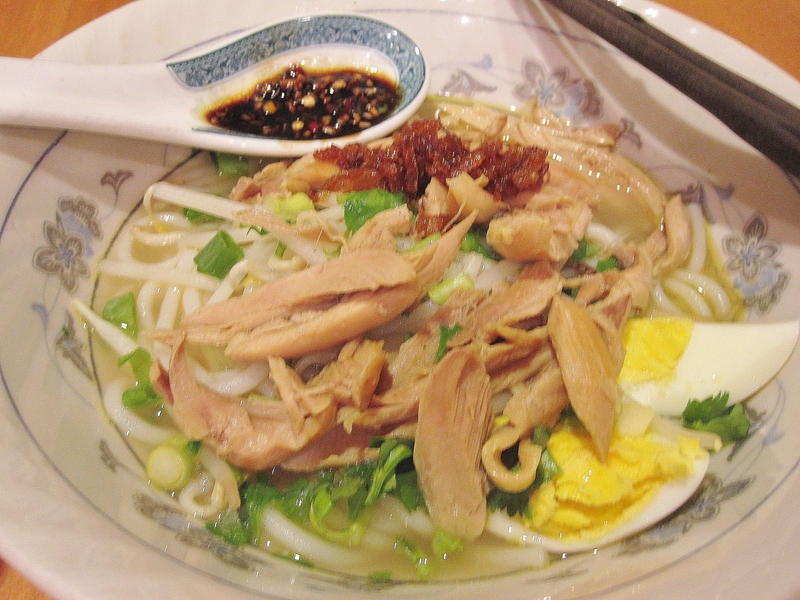 It’s COLD out there… what a perfect time to have a bowl of Soto Ayam to warm up my body and soul. For readers who are not familiar with Soto Ayam, it is a yellowish (comes from turmeric powder) chicken noodle soup that made popular in Malaysia and Indonesia, each with a slightly different version. Adding some water, blend onion, shallots, garlic and coriander into paste. Heat 2 tbsp oil in a deep pot on high heat, fry lemon grass, cardamon and star anise until aromatic. Add in paste, turmeric powder, cumin, and fry until the liquid almost dries out and aromatic. Add in drumsticks and stir until the meat is cooked on the surface. Pour in chicken broth and water and bring to a boil. Turn down to medium heat and simmer until chicken is cooked. Remove chicken and set aside to cool slightly. Remove chicken skins and bones, and hand shred the meat. Set aside. Strain the soup base. Return soup to heat, add white pepper and salt to taste. To serve, place some noodles/ketupat in a bowl, top with shredded chicken, hard boiled eggs, bean sprouts and lime wedges. Scoop in some soup broth, and garnish with fried shallots and green onion/cilantro. Serve with sweet hot pepper sauce. Enjoy! This is the first time I cooked Soto Ayam. I used a little too much onion as my soup has a onion taste. I later compared several Soto Ayam recipes and found that either shallots or onion is used, but not both.